If imitation is the sincerest form of flattery, then Sony must have been blushing for the last thirty years. 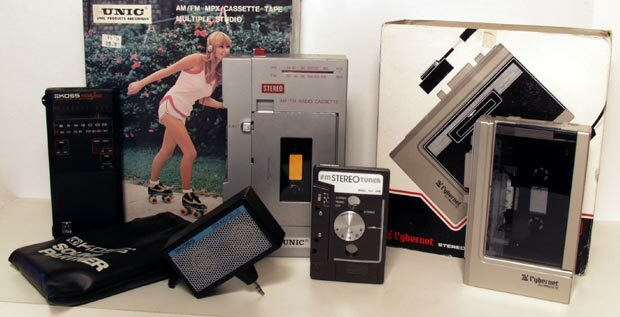 Almost immediately after the release of Walkman, electronics manufacturers responded to Sony with cheaper, better or more stylish versions of the original personal stereo. Through the ’80s, a competitive market forced many players out but through the battle consumers enjoyed a terrific selection of unique and innovative models. l-r: Roller Phone RP-313 w/ RP-1 FM tuner pack; Soundesign Musicmate; Nippon FS-884; Sonaryo SPR-120; Unisef Companion V-2. l-r: Koss Music Box 6783; Unic Multiple Studio RV-2 w/ box; Koss Sound Cells mini speakers; Chikuma C-1 FM tuner module; Cybernet IntiMate-II PS-103. l-r: KLH Solo S-200, S-100 w/ box; Infinity Intimate RS-002 w/ box. l-r: Craig Soundalong J700; Technidyne Hip Pocket HPS170A; E.R.S. Street Walker XL-1000 w/ detachable right speaker; Cybernet Mini Concert PS-101. l-r: Unitech Mini 2010 w/ AM/FM Tuner Pack, IS-118F w/ FM Tuner Pack; Philips FM-sky Way D6628; Shinaon Audiomate Model MM-1 Stereo; Stewart ST977; JIL Citizen JWS556. l-r: Windsor CS-880; Kasuga KC-251; Rand’s Model 404; E.R.S Street Walker I; GE Escape 7-5270, 7-1000A. l-r: Mura hi stepper HI-3, HI-EX3, HI-ML2, HI-9; Realistic 12-115, 12-111.
l-r: Telefunken CFM-3; Pioneer PK-R7AW; Grundig Beat Boy 100; Akai PM-R1 w/ FAM-1 AM/FM Tuner Pack, PM-01 w/ FM-01 FM Tuner Pack. l-r: Hitachi CP-2, CP-88R w/ CP-TU1 tuner module & CP-RU1 recording unit, Perdisco CP-15. l-r: ’80s US & Japan portable stereo catalogs.